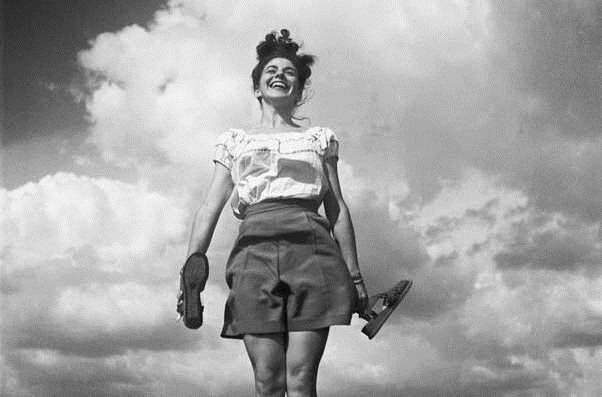 "My Florence: Photographs by Art Shay"
The dean of Chicago photojournalists, Art Shay, shares pictures of his beloved wife Florence, who died in 2012 after 67 years of marriage. We get a preview of the exhibit, My Florence: Photographs by Art Shay, at the Columbia College Library, 624 S. Michigan Avenue. Read an interview with Ann Nathan, a gallery owner who currently represents Shay. You represent mostly painters. Why are you representing photographer Art Shay? You are right. This is the first time we’ve had a photographer’s works in the gallery and I don’t know if we’ll have any after [Art Shay]. We chose to showcase his photographs because it’s a very sweet story. And even though we have some photos in the gallery from painters, photography is new to the gallery. The work we show here is based on realism in all shapes, forms and mediums, so his photographs make sense to the gallery. The response was enormous; the opening was unbelievable. The weather on opening night was a disaster. Although it was raining, most people couldn’t get through the door because the gallery was jam-packed. It was a success because his work was good, and we presented it in a way most wouldn’t—we framed everything. Even if they weren’t familiar with his work, they knew his name. He’s got them all. But—well, that’s Chicago. As far as his career goes, he’s got every story imaginable. He was actually in the paper the other day (Printers Row) in last Sunday’s issue. It was a marvelous section about Art’s show. He takes great pride in having almost a rediscovery of [his] talent. Even though he’s well-known, he’s excited that this is happening in his life right now. Do the photos in your gallery represent a variety of his work, or are they very specific regarding time period or subject matter? There’s a variety of his work here. They are random and yet very succinct. We also showcased a lot of newspaper comments in response to his work, to his exhibit. Do you have favorite images of his? Yes. I love this one photo of a bus stop. It’s very Chicago. In the photo, it’s raining and there are people just waiting for the bus. I’ve never shown photography, so it’s very interesting to me. I don’t know much about the art of photography but I’m very involved in it. What is Art Shay like personally? He’s really interesting and his work has great range. He’s very down-to-earth and easy to relate to. For a 90-year-old, he is very lucid. [Art is] just an overall delightful human being. I’m honored he chose us.